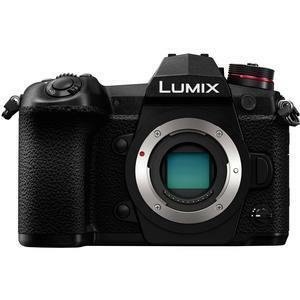 The Panasonic LUMIX DC-G9 boasts outstanding mobility with ultra-high-speed response, and it achieves amazing image quality with its 20.3MP Digital Live MOS Sensor without a low-pass filter. A High Resolution mode provides 80-megapixel equivalent images in JPEG/RAW formats produced in-camera. Body I.S. (Image Stabilizer) provides up to 6.5 stops of compensation. Additional features: world's fastest AF speed of 0.04 sec. ; fastest-in-class 20 fps (AFC) / 60 fps (AFS); 6K/4K PHOTO modes; largest-in-class LVF (Live View Finder); no blackout shooting in LVF; magnesium alloy construction; splashproof, dustproof and freezeproof; top status LCD; 3.0-inch free-angle LCD; double SD Memory Card slot; Bluetooth and Wi-Fi connectivity; plus more.